Well my wonderful readers, I have finally made the leap to natural! On December 27, 2009 I did a live broadcast of myself cutting the rest of my relaxed ends off. It was such a freeing feeling to not have to deal with damaged chemically treated hair any longer. As I write this, I am uploading an abridged version of the live broadcast to YouTube. I was so nervous (with excitement) while I was snip snip snipping away! Because of my nervousness, the original broadcast was longer than I planned, and I jabbered non-stop. 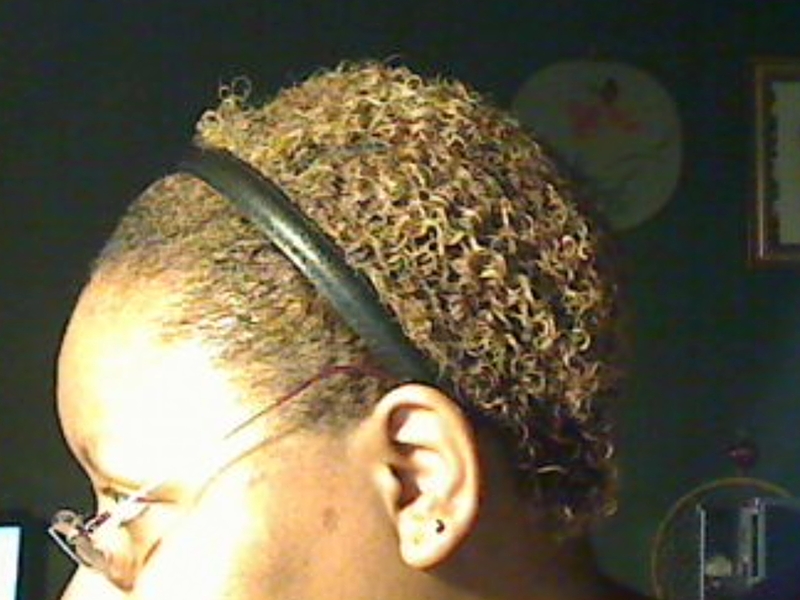 I just love playing with my curls and coils without the limp straightened hair in the way. I went to Vegas the day after the chop, but I wore a wig to protect my hair from the elements (it was cold in Vegas last week—brrrr!) Since it’s been pretty warm here back home in Palm Springs, my hair has been allowed to be free and wild. I gave it a really nice, deep conditioning treatment yesterday, and my hair is thanking me non-stop LOL. Right now my hair is just to the bottom of my neck. My plan is to have my hair be at least shoulder length by December 2010. I think that if I make sure that I don’t do too much my hair will flourish and continue to be healthy and gorgeous for years to come. 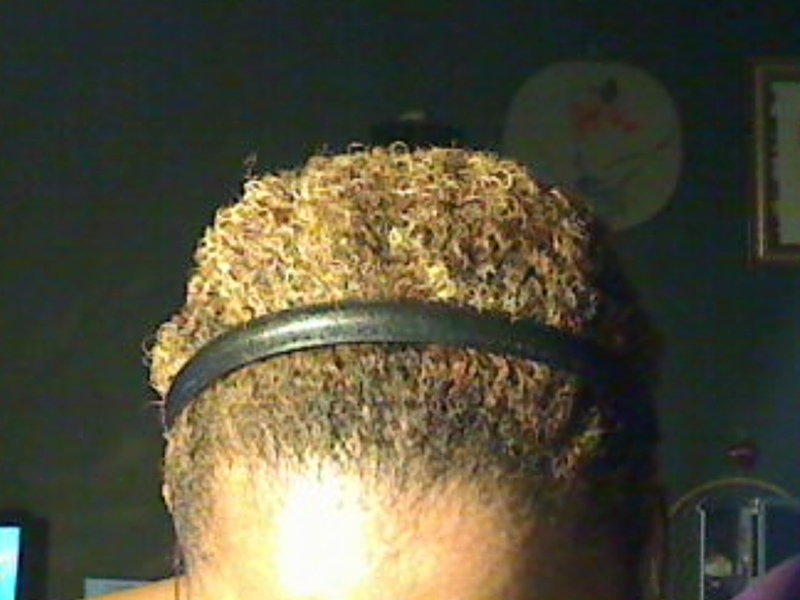 New Color and Going Natural! So it all started with me wanting to surprise my husband when he came home from his trip. I tried to make my long near-black hair platinum blonde. I hear the chorus of “uh ohs” in the distance, and they’re right. Not understanding the science of hair color, I thought that simply grabbing the lightest blonde shade available (for AA hair) would give me the same flaxen hair as Miss Mary J. Blige (love her!). Of course Iwas WRONG. I was welcomed by an orange mess that I couldn’t get rid of no matter how many times I bleached–like four times in two weeks. My husband saw what I had done when he came home. He felt so sorry for me, he gave me money to get color correction done by a professional. After carefully researching my options, I found a wonderful stylist who specialized in high-lift hair tones. After some strand tests to find out what would work, she found a viable solution. My hair came out a nice golden blonde on the first three inches. The rest would refuse to give up the orange. After unsuccessfully trying to tone the orange, it was clear what needed to be done: chop, chop! I hadn’t planned on going natural until my grays started coming in. Getting that big haircut ahead of scheduled convinced me to decide to go on the natural journey early. Since I get my hair bleached, I am not going to go back to relaxers–I think relaxing was the reason so much of my hair fell out after my last touch up (gee, ya think?). Anyway, since my hair was extremely vulnerable at that point, my stylist (hi, Ms. B.J.!) recommended a BKT. She gave me a brochure, showed my her certification with some info and let me think about it. My wonderful husband shelled out the $300 for me to get it done. I cannot express enough how much my hair turned around with just that one treatment. It went from weak, fragile, breaking and dull to shiny, strong and healthy feeling. I got the treatment that requires at least 72 hours before wetting the hair; hard to do when I’m tempted by our pool and going to gym classes at college. Somehow I managed to get through it. Let me tell you, when I say that my hair after cleansing was much more managable, I mean it. My natural curl was looser, but still there. The comb went through from root to tip like a hot knife through butter. Within a week, my husband noted that my hair not only looked thicker, but felt thicker, too. Lo and behold, he was right! I can easily see that I will be making BKT a part of my hair care routine. I can’t wait to see where this natural journey takes me! It’s back to basics for me. If you read my other post “Snip!”, you already know that I had to cut off a bit of my hair due to damage. I should have known better. Now I’m going back to basics to regain the length that I was gaining before I let damage set in. These are what I’ve found to be the basics of caring for naturally curly hair. The main key is moisture. Curly hair has a tendency to feel really dry. Because of the curves and corners of our individual hairs, the natural oils have to work much harder to flow down the hair shaft. This may be the reason many women decide to straighten their hair–trying to capture the shine and sleekness that comes with straighter hair. Those of us who have made the choice to embrace our curls also know what it is to make sure there is a balance to having curls: full of bounce and body, yet moist and manageable. I have learned some tips from fellow curly-haired divas. What does it mean to baggy with moisture? To put it simply it is applying moisture to the hair (either with water, conditioner, leave-in or any combination of these) then using a conditioning cap to cover the moisturized hair. I usually do this at night before I go to bed. Be careful not to put too much moisture on the hair before baggying or else you will have a wet neck, wet pillow…you get the idea. It’s also possible to pass the limit of moisture intake for your hair, so be sure to monitor your hair’s condition when first starting out. Why baggy with moisture? To give your curls a chance to hydrate. When to baggy with moisture? You can do this after your shower/hair cleansing, before or anytime you feel your hair needs the extra moisture. Since I work at home (lucky me, right? 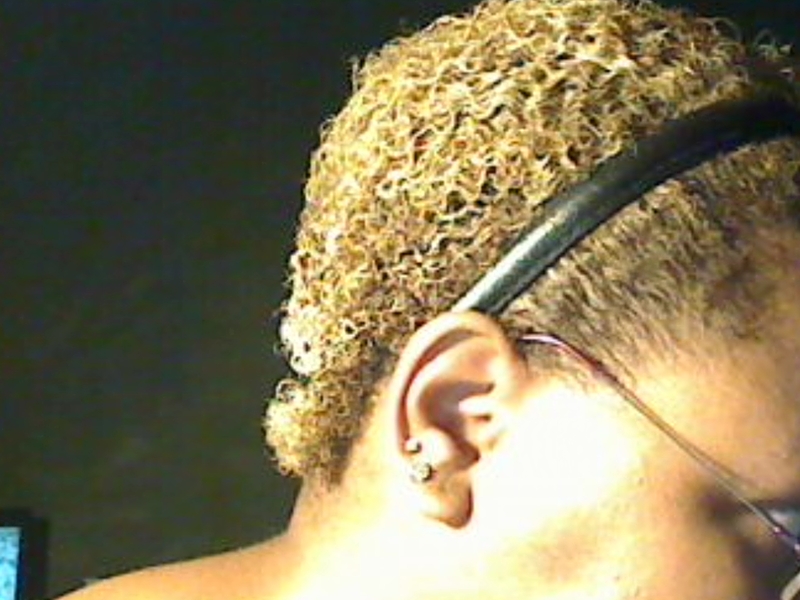 ), I like to baggy after I cleanse my hair, just so that I can keep as much moisture in my curls as I possibly can. I usually leave the cap on my hair for anywhere from 30 minutes to overnight. Start with about 15 minutes at first, and then if your hair seems to respond well to it, you can increase time until you find the limit. The limit is when your hair absorbs so much moisture that it becomes mushy and lifeless–you don’t want that–so, as I stated before, try it in small increments first. Side note: If you have good moisture levels, but your ends are looking worse for wear, then you can make a ponytail, apply moisture to your ponytail (just the ends or the whole pony), then put a small plastic bag around your ponytail to give a concentrated infusion of moisture to your hair ends. Since curly hair is more prone to being dry, it is important to keep as much moisture as possible in the hair, while keeping the scalp clean. How to do all this? Conditioner to the rescue! Yes, you read right–conditioner. I was not sure when I first found out about using conditioner as a way to cleanse my hair while keeping moisture levels high in my hair. As my Grandma says, I’ve gotta see this for myself. So I got into the shower and wet my hair. I almost reached for shampoo out of habit, but passed it over for conditioner instead. I poured a small amount into my palm and concentrated the conditioner on my scalp, working it in like shampoo. After messaging it in, I rinsed it out and finished my shower. It still felt weird not to use anything with suds in it, but I forged on. After letting my hair dry, I gave co-washing the litmus test: scratched my scalp. I was almost scared to look under my nails. When I did I saw…nothing! My scalp was as clean as if I used my suds–couldn’t believe it so I tried it again on another part of my scalp. Same thing; nothing. On top of it, my hair was feeling quite good, not as stripped as it usually did. I was told the reason for this. Little known to me many conditioners contain a bit of the same ingredients that shampoo has. The action of scrubbing the scalp is actually the legit reason the scalp gets cleaned, not just the fact that there are suds on top of my head. This actually made sense to me. Now I use co-washing as a regular part of my hair cleansing regime. My curls behave much better, and the growth I’ve been getting is starting to show in my length because I get to keep moisture in my hair, which keeps my hair from breaking as much as it used to. When you mention putting oil on the hair, many people will run and hide. Oil conjures images of flat, limp, lifeless hair. This is true depending on the oil. As a matter of fact, there are cultures where applying particular oils to the hair results in luster, body and health of the hair. Yes, heavy oils will weight hair down, and may be more suitable for a hot oil treatment before cleansing. Steaming is simply applying conditioner, then using steam to open up the cuticle of the hair. This allows more to get into the hair shaft. The result is much less frizz in humid temperatures. Less frizz means better maintained curls! Deep conditioning is a valuable part of your haircare regime. The key word throughout this post has been keeping curly hair moist. If you’ve read about the steaming, then deep conditioning is simply the same thing without the steam. 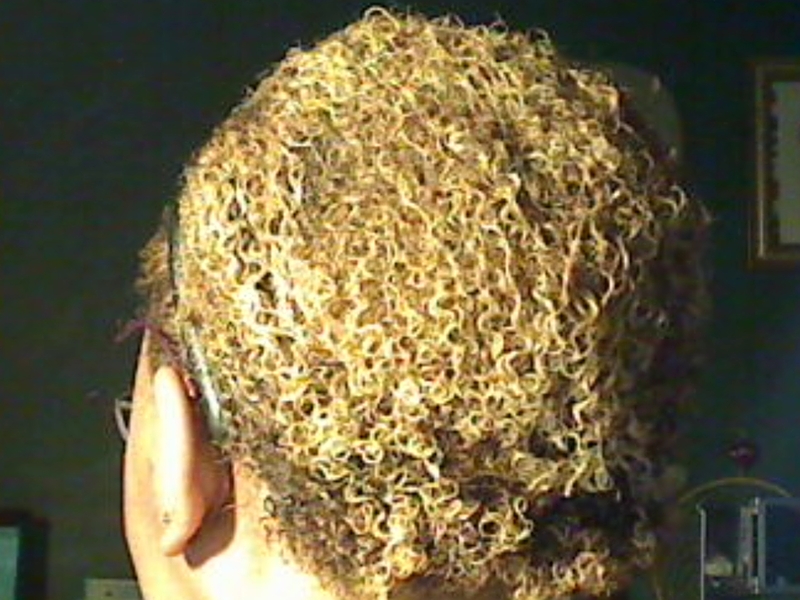 If your hair is coarse (like mine) deep conditioning may benefit you if you do it about 2-3 times a week. If your hair is not as coarse, about 1-2 times a month. If you’re one of the lucky ones who rarely has a problem with your hair, deep conditioning might still benefit you–you just won’t have to do it so often. Think of it as a treat you can give yourself every now and then.